The situation in eastern Ukraine is deteriorating and continues to have a severe impact on human rights. Following recent shelling of water treatment workers in eastern Ukraine, a senior United Nations official has called on all parties to the conflict to protect those civilians who maintain critical infrastructure. “I am deeply concerned that water treatment workers and critical infrastructure continue to be targeted in eastern Ukraine’s armed conflict,” said Neal Walker, UN Resident Coordinator and Humanitarian Coordinator in Ukraine, in a statement issued on Wednesday. “It is clear that any targeting of civilian infrastructure and intentional disruption of access to water supply or heating systems is a violation of international humanitarian law,” he added. In the last eight days, workers seeking to maintain the Donetsk Filter Station have been shot at on four separate occasions. The operation of the facility relies on the safe and unfettered access for the technicians, who risk their lives on a daily basis so water continues to flow to 345,000 people affected by the conflict. On Tuesday, a truck was fired upon while making a routine delivery of water treatment chemicals vital for continued operations. A bus carrying 30 workers was also fired upon. It was only due to good luck that no one was hurt, Mr. Walker said. Given Ukraine’s harsh winter, any interruption of water supply or inter-dependent heating systems could generate severe humanitarian consequences, he warned. After four years of armed conflict, ordinary men, women and children continue to be the most affected in eastern Ukraine, with their most basic needs, including safety and protection continuing to be denied. Millions of Ukrainians are either trapped in active hostilities or displaced and are losing hope, he said. 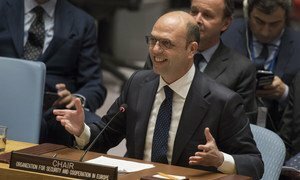 The conflict in eastern Ukraine is testing the core shared values, and the only way to rebuild trust between warring parties is “more dialogue, more political will and more concrete action on the ground,” the chairperson of an European intergovernmental security organization told the United Nations Security Council on Thursday.